Several UC graduate students will offer input on key policy issues — such as conservation and energy use — at the state level, at the request of California lawmakers. UCLA public affairs students Kristen Figueira and Michael Haddad will submit comments to a legislative hearing on energy efficiency and urban planning. The students have been at work on an interactive map charting energy consumption in California. UC Santa Barbara ecology graduate student Emily Rivest, who is investigating how coral reefs and coastal species are coping with rising ocean acidity, was invited to submit recommendations on policies aimed at protecting marine ecosystems. The invitations emerged from Graduate Research Advocacy Day earlier this month, in which a delegation of UC graduate students visited Sacramento to meet with lawmakers and their staffs. The message they delivered: Think of UC – and its 26,000 graduate students – as a valuable partner and resource. UC graduate students often are at the leading edge of research in their fields. The meetings gave California lawmakers a chance to see first-hand how important graduate research is to issues vital to the state. “There’s not a lot of understanding of what you do, the investment it requires and the potential we have to be visionary” by supporting graduate education, Assembly member Susan Bonilla told delegates. Delegates ranged from a history student investigating obscure legal restrictions on marriage and immigration to an engineering student who has developed a faster, more efficient microprocessor. Their common purpose was presenting work that can inform better policies, create stronger and more resource-efficient societies, and lead to innovations that will power the economy and save lives. Graduate research "allows you to ask questions that drug developers wouldn't even be considering,” said Kristina Hargraves, a UC Berkeley graduate student studying the cancer-fighting effects of broccoli. Practical application of basic research like Hargraves’ might span the careers of dozens of graduate students. It relies on a willingness to risk false starts and delayed financial returns — risks that are not often possible in the commercial sector. "It's a long road between basic science and having a pill to cure disease, but it's a road well worth traveling,” said Andrew Szeri, UC Berkeley graduate dean. The freedom to test bold new ideas and theories without the constraints of short-term profit enables innovation that ultimately yields far greater returns. It results in new inventions, new companies, even the birth of entire industries. "Investing in UC research is probably as close as you can get to printing money,” said Jeffery Gibeling, UC Davis graduate dean. At least two legislative staffers discovered they would benefit first-hand from technologies UC grad students are developing. One staff member had waited several weeks for a cancer diagnosis. That wait would have been shortened or even eliminated by a new lens-free microscope technology developed by UCLA graduate students that eventually could allow doctors to make such a diagnosis on the spot. A family member of another aide had been treated with a cancer-fighting drug developed with the help of graduate students at UC Berkeley. 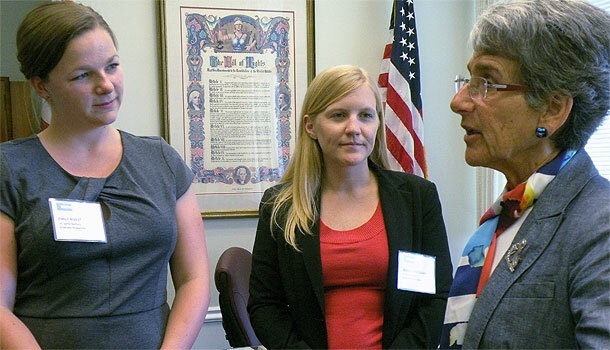 Photo at top: UC Santa Barbara graduate students Emily Rivest and Jessica Bradshaw meeting with California State Senator Hannah-Beth Jackson. Profile and Q&A with UC Santa Cruz graduate student Meghan Powers, who was part of delegation in Sacramento.